Joseph de Veuster was born in Tremelo, Belgium, in 1840. To help support his family, he quit school at age 13 to work on their farm. Six years later, Joseph resumed his studies when he joined the Congregation of the Sacred Hearts of Jesus and Mary, taking the name Damien. His brother was a priest in the same congregation, and had been assigned to the Hawaiian Islands but fell ill before he could go. Damien volunteered to take his place. In 1873, he visited the Hawaiian government's leper colony on the island of Molokai. Originally he was scheduled to minister there for three months each year. Seeing the residents’ dire need, he soon volunteered to stay with them year round. Fr. Damien quickly brought many improvements to the colony, including better housing, a new church, a new school and an orphanage. A few years later he recruited the Franciscan Sisters of Syracuse, led by Mother Marianne Cope, to share his ministry (More than 50 religious congregations had previously declined this mission). Mother Marianne with six other sisters arrived in 1883 to serve the female residents of the colony. In 1888 she was called to care for the dying Fr. Damien, who had contracted Hansen's disease, and to assume his burdens. Father Damien’s and Mother Marianne’s sacrifices were all the more extraordinary because at that time there was no known cure for Hansen’s disease, which was then called leprosy. Their feast days are May 10 and Jan 23. When Joseph de Veuster was born in Tremelo, Belgium, in 1840, few people in Europe had any firsthand knowledge of leprosy (Hansen's disease). By the time he died at the age of 49, people all over the world knew about this disease because of him. They knew that human compassion could soften the ravages of this disease. In 1873, he went to the Hawaiian government's leper colony on the island of Molokai, set up seven years earlier. Part of a team of four chaplains taking that assignment for three months each year, Damien soon volunteered to remain permanently, caring for the people's physical, medical and spiritual needs. In time, he became their most effective advocate to obtain promised government support. Soon the settlement had new houses and a new church, school and orphanage. Morale improved considerably. A few years later he succeeded in getting the Franciscan Sisters of Syracuse, led by Mother Marianne Cope (January 23), to help staff this colony in Kalaupapa. Damien contracted Hansen's disease and died of its complications. As requested, he was buried in Kalaupapa, but in 1936 the Belgian government succeeded in having his body moved to Belgium. Part of Damien's body was returned to his beloved Hawaiian brothers and sisters after his beatification in 1995. Marianne Cope was born Barbara Koob in Germany in 1838. When she was two years old, her family emigrated to the United States, to upstate New York, to find a better life. After 8th-grade graduation, she worked in a factory to earn money to help her family. Her dream of becoming a nun had to be delayed until her younger brothers and sisters could support themselves. She joined the Sisters of St. Francis in Syracuse when she was 24. After taking her vows, Marianne taught in Catholic schools and then became a principal. Her Franciscan sisters recognized her gift for leadership and elected her to their board. The Franciscans established two hospitals in New York, and Sister Marianne became a nurse and the first director at one of the hospitals. She and her Sisters insisted that the hospital treat patients of every race, nationality, and religion. This policy was criticized by many people, but Marianne believed in equal treatment for all people. Marianne became Superior of her order and was called “Mother.” One day she received a letter from the Hawaiian government begging for help in treating the island lepers. Dozens of other religious orders refused the request, but Marianne felt that it was a call from God. More than 35 Sisters volunteered, but only six were chosen to accompany Marianne to Hawaii in 1883. Mother Marianne spent 30 years caring for the lepers of the Hawaiian Islands. She and her sisters built hospitals to treat the lepers and also established homes and schools for the families of those affected by the disease. 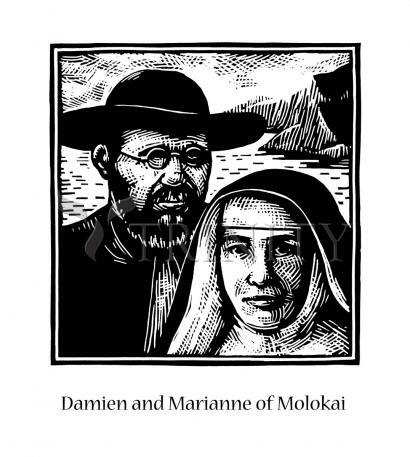 Mother Marianne worked with St. Damien de Veuster, a Belgian priest known as the “Apostle to the Lepers” of Molokai, where he established a colony for them. She continued his work when he became ill with the disease and died. Mother Marianne died in Molokai in 1918 and was declared “Blessed” in 2005. On Oct. 21, 2012, she was formally named a saint. I now turn to Marianne Cope, born in eighteen thirty-eight in Heppenheim, Germany. Only one year old when taken to the United States, in eighteen sixty-two she entered the Third Order Regular of Saint Francis at Syracuse, New York. Later, as Superior General of her congregation, Mother Marianne willingly embraced a call to care for the lepers of Hawaii after many others had refused. She personally went, with six of her fellow sisters, to manage a hospital on Oahu, later founding Malulani Hospital on Maui and opening a home for girls whose parents were lepers. Five years after that she accepted the invitation to open a home for women and girls on the island of Molokai itself, bravely going there herself and effectively ending her contact with the outside world. There she looked after Father Damien, already famous for his heroic work among the lepers, nursed him as he died and took over his work among male lepers. At a time when little could be done for those suffering from this terrible disease, Marianne Cope showed the highest love, courage and enthusiasm. She is a shining and energetic example of the best of the tradition of Catholic nursing sisters and of the spirit of her beloved Saint Francis.